Palmia Observatory: Hooray, Sky-Watcher success at OCA Star Party; Use your cell phone for daytime polar alignment; Calling all citizen scientists, get your astro data! Hooray, Sky-Watcher success at OCA Star Party; Use your cell phone for daytime polar alignment; Calling all citizen scientists, get your astro data! Last post of January 19 we described how we were seeking a more lightweight way and easier way to set up some sort of tracking mount so that we could just take the camera and tripod outside and collect some quick spectra or light curve data. We elected to tryout the Sky-Watcher as a means to get longer exposure times with just a camera and tripod. Luckily, the OCA star party was just coming up so we decided to brave the cold and tryout the setup. So Resident Astronomer Peggy and I showed up at the new Bob Swenson Field OCA star party site about 5:00PM and started setting up before sundown. We had a leisurely picnic dinner with OCA and Ham Operators, Marty and Bonnie, and OCA Star Party Coordinator, Steve. Yummy, now that is how to wait for the sun to go down. Lot's of folks seemed to have a good time. Resident Astronomer Peggy pretty much talked with everyone and found at least some time to enjoy the night sky with her binoculars. Thanks everyone! Even Semiconductor Physicist, Now OCA, John, showed up with his new imaging camera. John found he needed a bigger battery to run all of his stuff, luckily OCA With a Big Dob, John, had a spare battery pack. I really liked the spare battery, in this case a Cat Power Station, because it had a built in inverter so that 120 VAC accessories as well as USB powered accessories could also be powered. When I finally get my spectroscopy act together and connect my spectrometer to the scope, I will need extra amounts of 12 VDC power and 120 VAC to keep the laptop running. It is time to start looking for a good solution to this power problem. After the sun went down, the air temperature really started to cool off and got down to about 36 degrees F. Oh well, that is what happens and we were mostly dressed for it. 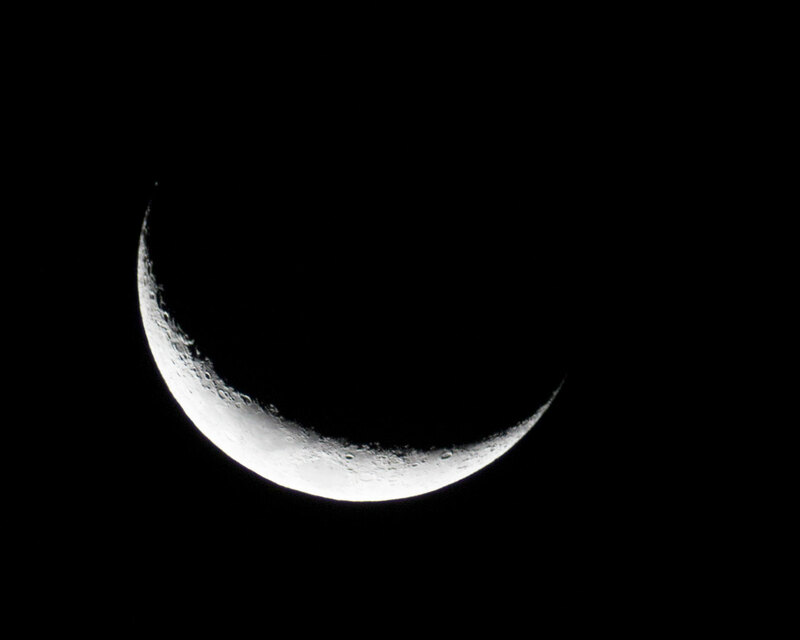 I set up the 80mm refractor, but mostly wanted to try out the new Sky-Watcher, so I just took one image of the brightest thing in the sky then which was this crescent moon. Next up was the polar alignment of the Sky-Watcher. The built in polar alignment scope worked well and the sky was dark enough that finding Polaris was easy to do. The Sky-Watcher app shows the current location of Polaris with respect to the North Celestial Pole, so it was easy to align the right ascension axis with the NCP. With the Sky-Watcher polar aligned, I removed the camera from the 80mm scope and attached it to the ball head, which itself was attached to the Sky-Watcher. See the January 19 post if you can't remember how all of these accessories fit together. 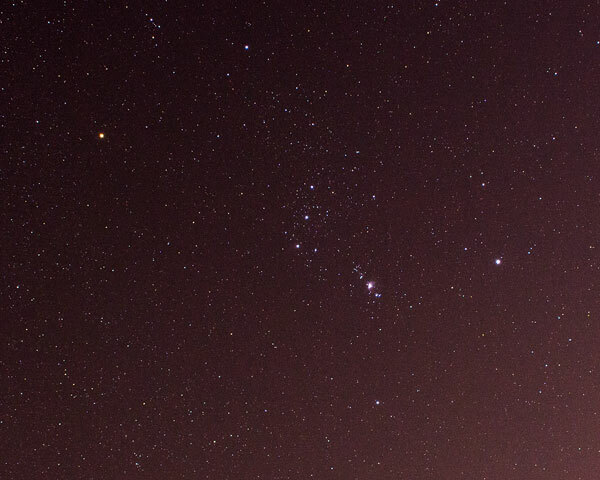 Then since I was primarily interested in how the system would work for long wide field camera exposures on dim celestial objects, I picked the constellation Orion, which was quite high in the sky. To focus the camera, I just pointed it at the moon and used that bright crescent refocus again, this time with the 18mm telephoto lens setting. It took me awhile adjusting the ball head so the camera pointed toward Orion, without slipping and falling away, but I finally figured out which of the 3 x-y-and-z adjustment knobs had to be loosened and then retightened at the right time. Lesson learned: It is best to practice doing this during the daylight so you have some sense of where the knobs are and when and how much to tighten them, all at the sametime as not to disturb the tripod and tip it out of alignment with the NCP. Anyway, it all looked ok, so I set the camera to "Bulb", clicked the shutter release and stood by for the 120 second timer to time out. The Sky-Watch has built in ntervalometer and can control the camera too, but I don't have the interface cable (yet). See the image below. Wow, what happened? Why are all of those star trails present? 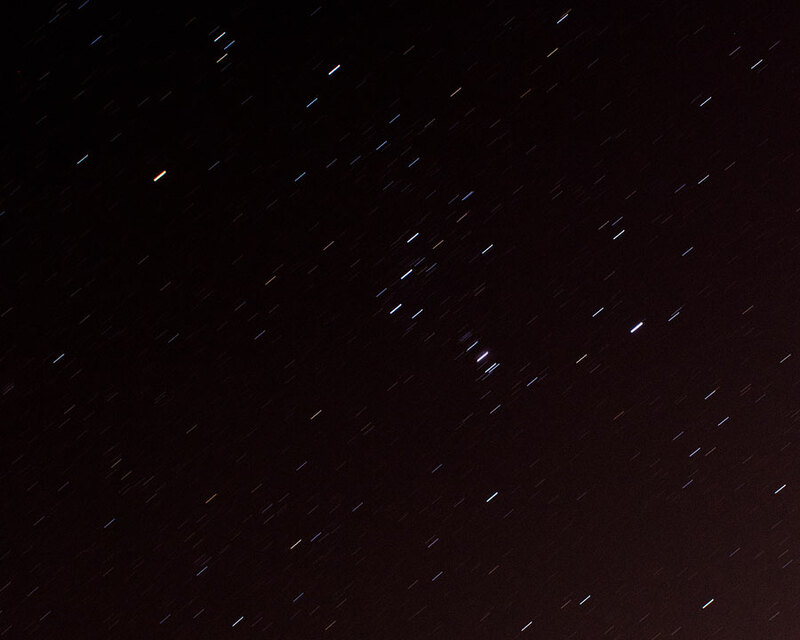 I can't see Orion in this mess of stars at all! Oops, I found out what happened! It wasn't because the tripod had been bumped out of alignment, but a case of operator error. I forgot, having just read he Sky-Watcher manual the night before, that I had to click on the run icon on the IPhone app. Ok, ok, let's try that again! Check out the image below now with the tracking turned on. Wow, now that 120 second exposure looks pretty good! The four main stars and the three stars in the belt in Orion constellation is there and even the Orion nebula shows up also. 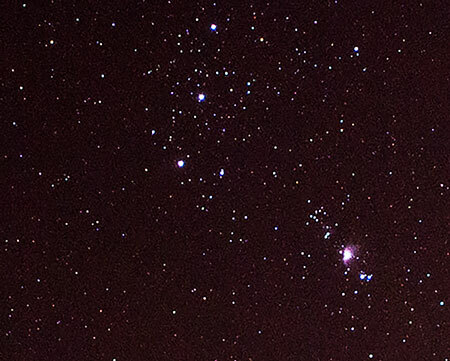 When it got a little too cold for us, we packed up and left the party about 8:30PM and then latter the next day, magnified and cropped the Orion image to get a little more detail of the Orion nebula. The image blow shows the three stars of Orion's belt and the nebula at the bottom right. It's great to see stars as round spots of light without a lot of trails. This looks pretty good, but the real test will come some other evening when we try out the Sky-Watch with say a 300mm telephoto lens, rather than the 18mm lens. That new lens setting will have field of view of 300/18 = 16.7 times smaller, so any polar misalignment will start to show up a lot more. The upcoming total lunar eclipse will be a great chance to test the Sky-Watcher with the 75-100mm lens. So when the total lunar eclipse rolls around on December 31, 2017 between 4:00AM to 6:00AM, I will be able to stumble out of bed and grab the camera tripod, with camera and Sky-Tracker already installed, and carry it all outside and be setup in 5 minutes. If you have misplaced the eclipse timing, check out the recent January 17 blog post which has the eclipse timeline. By the way, just in case you were wondering, how you can get a pretty close polar alignment during the daytime, check out this article in Sky and Telescope magazine of May 19, 2017. This looks pretty simple to do and the accuracy of alignment just depends on the accuracy of your smartphone planetarium software. 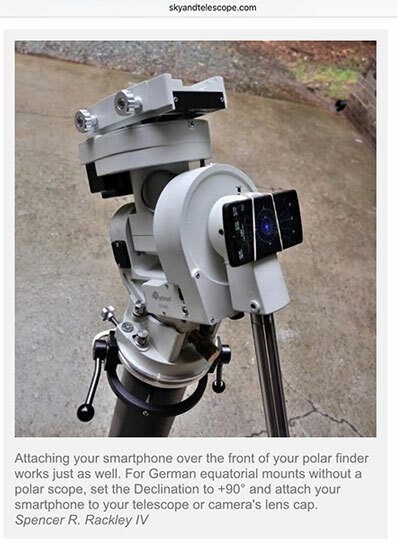 You just half to keep in mind that the smartphone thinks it is looking at the south celestial pole, so if Polaris is normally like 33 degrees elevation here, you would have to move the mount until the app says you are looking something like 33 degrees below the horizon. I could use this approach when doing some solar observing. Previously, I had just guess where the NCP was and where North actually was and started observing. Previously, the mount did a pretty good job based on that guessed alignment and I would have to just tweek the positioning every 10 minutes or so to keep the sun centered in the eyepiece. Maybe this new approach will be more effective. We will have to try it out and wait and see! Ok, all you citizen scientists or physicist wannabes you can now download and analyze for yourself a lot of astronomical observations, made by the professionals, which has now been released for public use. I got an email from Wants to build a Cubesat, Dr. Don, who found this interesting article about now publicly available data that citizen scientists can sift through and see if they can find the illusive Planet 9. Recall that based on an analysis of the eccentric orbits of some Kuiper belt or Oort cloud objects, it was conjectured that this condition could easily be explained if some unknown, planet, about 10x heavier than Earth, was way out in the solar system and had perturbed these outer solar system objects to have the weird orbits they now have. Well, the big folks couldn't find much observational evidence, but maybe you can find something in the data. Check it out at the following website reference. Thanks for that Don! 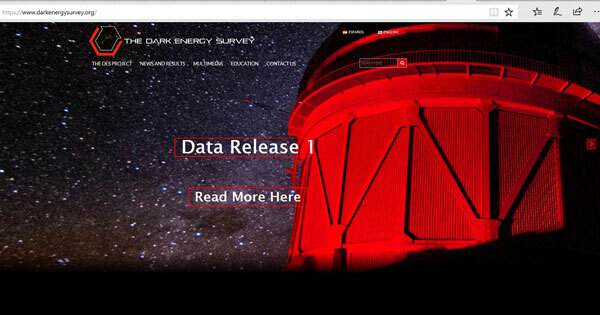 I haven't sifted through any of that data, but there are several other programs and I have signed up for free public access to data from the Dark Energy Survey and the LIGO gravitational wave survey. The DES data can be reanalyzed using freely available DS9 image processing software or your own favorite version. Hey, I might get caught up in just doing armchair analysis and not go out into the cold outside anymore. After looking at some of LIGO Python coding and all the signal processing algorithms, like fast Fourier transform, etc., I felt like I was in a bad dream and back at work. Oh well, I'll still give it a try. At least I can check in with Searching for Gravity Waves, Dr. Gary, for help with Python. Hmm, I guess it will all be ok and still fun to get outside too!